Manned missions to deep space present numerous challenges. In addition to the sheer amount of food, water and air necessary to keep a crew alive for months (or years) at a time, there’s also the question of keeping them busy for the entirety of a long-duration flight. Exercise is certainly an option, but the necessary equipment will take up space and be a drain on power. In addition, they’ll need room to move around, places to sleep, eat, work, and relax during their down time. Otherwise, they will be at risk of succumbing to feelings of claustrophobia, anxiety, insomnia, and depression – among other things. NASA has been looking at a few options and one proposed solution is to put these crews into an induced state of hypothermia resulting in torpor – a kind of hibernation. Rather than being awake for months or years on end, astronauts could enter a state of deep sleep at the beginning of their mission and then wake up near the end. This way, they would arrive refreshed and ready to work, rather than haggard and maybe even insane. If this is starting to sound familiar, it’s probably because the concept has been explored extensively by science fiction. Though it goes by different names – cryosleep, reefersleep, cryostasis, etc. – the notion of space explorers preserving their bodies through cryogenic suspension has been touched upon by numerous sci-fi authors, movies and franchises. But NASA’s plan is a little different than what you might remember from 2001: A Space Odyssey or Aliens. Instead of astronauts stepping into a tube and having their temperature lowered, torpor would be induced via the RhinoChill – a device that uses invasive tubes to shoot cooling liquid up the nose and into the base of the brain. To research the technology, NASA has teamed up with SpaceWorks an Atlanta-based aerospace company that is investigating procedures for putting space crews into hibernation. During this year’s International Astronomical Congress – which took place from Sept. 29th to Oct. 3rd in Toronto – representatives from SpaceWorks shared their vision. 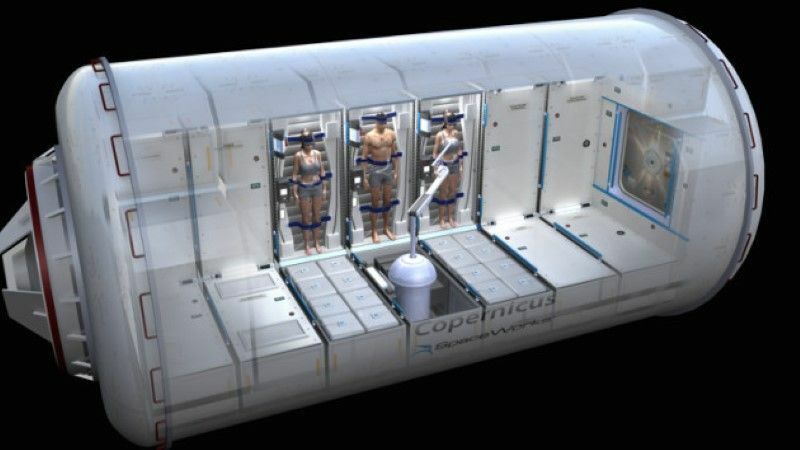 According to the company, inducing torpor in a crew of astronauts would eliminate the need for accommodations like galleys, exercise equipment, and large living quarters. Instead, robots could electrically stimulate key muscle groups and intravenously deliver sustenance to ensure the health and well being of the astronauts while in transit. In addition to cutting down on the need for room and supplies, keeping crews in hibernation would also save on another all-important factor: costs. With a crew in stasis, ships could be built smaller or have more room to accommodate safety features like radiation shields. At the same time, smaller, lighter ships would mean that material, construction, and fuel costs would be lower. According to SpaceWorks’ mockups, the size of a crew living quarters for a Mars mission could be reduced from the currently-proposed dimensions of 8.2×9 meters to just 4.3×7.5. Also, current projections indicate that a Mars ready-habitat for a 4-person crew would weight roughly 31 tons. But the company claims that a torpor-stasis habitat could weigh as little as 15. Of course, SpaceWorks also emphasized the psychological benefits. Rather than being awake for the entire 180 day journey, the crew would be able to go to sleep and wake up upon arrival. This would ensure that no one succumbs to “space madness” during the months-long journey and does something terrible – like take their own life or those of the crew! Naturally, there is still plenty of research and development that needs to be done before a torpor hibernation system can be considered a feasible option for space travel. RhinoChill has so far only been used in therapeutic scenarios here on Earth. The next step will be to test it in orbit. Luckily, the potential savings during a trip to Mars or somewhere in the outer Solar System could be just the incentive to make it happen. And no matter what, it seems that some form of induced-hibernation will be necessary if ever humanity is ever to explore the depths of space.